Life is constantly full of ups and downs. I’ve had my fair share of rock bottom moments but looking back those moments were actually pivotal moments in my life. I wanted to write this post to share with you how my rock bottom moments have served me in life. I know these lessons don’t make difficult times any easier but I thought maybe it could offer someone struggling a new perspective or a little bit of hope. When I reflect back on life living through the hard times really made me figure out who I am and what I wanted out of life. Without the struggle, I would have stayed on the wrong path and probably never really gotten anywhere in life. 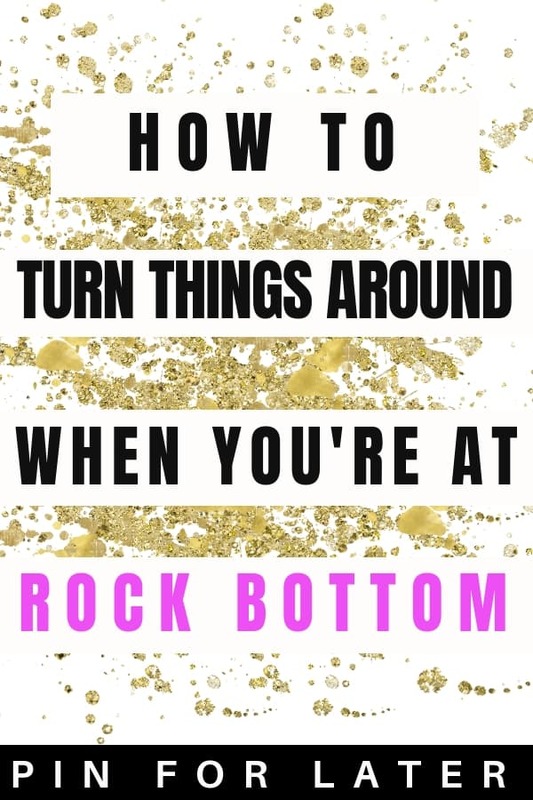 Here are some of the lessons I’ve learned during rock bottom moments. Be sure to check out the podcast episode all about surviving tough times below and subscribe to the podcast for more mental health podcast episodes. I’ve had many moments in my life where it became impossible to continue as life was before. There have been times when I lost my job, got kicked out of an apartment and ended a relationship all at the same time. These times felt overwhelming at the time and I felt like my life was falling apart. However, looking back I’m so thankful for these moments. It’s so clear that I was on the wrong path and that I desperately needed to make a change but was too scared to make the leap. I look at these moments when everything blows up as the universe forcing you back onto your true path. Every time I’ve had a rock bottom moment I’ve ended up living my life in a that is more aligned and authentic to who I really am. These moments of massive transition made me get clear about what I really wanted and where I wanted to go next. It became impossible to keep coasting through life and these difficult periods of life gave a lot of clarity about who I really and what I want out of this life. If you’re going through a rock bottom moment I suggest getting quiet and spending time with your journal. Ask yourself what the lesson is that you’re supposed to learn from this situation. When I’m stuck in the middle of a massive transition it’s easy to tell myself stories like “bad things always happen to me” and “life is so hard”. I know that these stories only makes it more difficult to find the good in the situation. Brainstorm empowered stories you can tell yourself about the situation. How is this serving you? How is this situation for your good? Getting clear about how the situation is actually serving me helps me stay positive during times of massive change. If you’re walking through a difficult time right now my biggest piece of advice is to get thankful. The truth is no matter how awful and unfair your situation is there is always someone who has it worse. There are always many blessings we can be thankful for at any given moment. It’s your job to remind yourself that life is actually amazing and you’re really freaking blessed. When walking through a hard time I think it’s important to remind yourself to stay thankful so you don’t slip into victim mode. Letting yourself play the victim will only drag out your situation because it’s difficult for your brain to come up with solutions when you’re playing the victim. If you want to get through this situation quickly you need to empower yourself that life is actually good and things always work out for you in the end. I always overcome. I’m an overcomer. Find some positive affirmations that resonate with you that you can start telling yourself when you feel like you’re starting to slip into victim mode. Every time I’ve walked through a hard time where I felt like everything was falling apart it ultimately ended up making my life WAY better than it was before. I was devastated when I lost my first job but ended up working somewhere so much better where I was much happier and got paid more money. Look for examples in the past where tough times have led to positive changes in your life. If you don’t have any personally find examples of other people who have come out the other side of a tough time even better than before. When I see other people walking through the change I get really excited for them because I know those moments where the most important moments of my life and led me back to my true path in life. Usually, the things that seem catastrophic at the time like losing a job or going through a breakup is really just the universe making room for the right job or person to come into our life. If you’re unhappy with how you feel about life right now you need to start figuring out what action you need to take to change your situation. This is a time to be thoughtful and spend some time getting clear before you take action. Don’t just make impulsive decisions to get out of your discomfort but spend time getting strategic and really figuring out what you want to do next. Here’s some journal prompts to help you get clear. If you could have any job/live anywhere/etc what would your life look like? If a genie granted you unlimited amounts of wishes what would you wish for? What do you wish you would have started doing five years ago? What gift could you give your future self today? What is your biggest regret in life and what is your proudest moment? Use these prompts to brainstorm and get clear about what you want out of life. Now is the time to figure out what the next steps are for you but you have to know what your end goal is before you can take meaningful aligned action. Want to remember these tips? Pin this article for later!